wings of war "famous aces" is a game of aerial combat for two players (or two groups of players) based on cards. it is a light war game, which nevertheless offers a lot of strategic options. the graphics are well done and the different types of planes are historical adequate. also the whole gaming eqiupment is of very good quality and fulfills its purpose for sure. after reading the rules, which shouldn't take longer than 10 minutes, you are ready to play. each person controls one or more planes, represented by a card showing a picture of it. depending on the type of plane, you have different decks of maneuver cards and also different decks of damage cards. at the beginning of each turn every "pilot" chooses three maneuver cards from the respective deck(s). after playing one of the three maneuver cards (and moving the plane accordingly), the distance to the opponent is checked and if the target is in reach, air combat is resolved. this means that depending on the type of plane a card for each hit is drawn from a certain deck of damage cards. different levels of damage are possible then, including critical hits or jamming machine guns - reminding me on something like a critical hit table and adding more depth to the game. after all three maneuver cards have been played and combats have been resolved, the next turn starts with planning the maneuvers and going on as described until all of your opponents planes have been destroyed. the game is a lot of fun and can be recommended without any doubt. one game usually lasts no longer than 20-30 minutes, although it's also possible to play different scenarios with certain mission goals and a lot of planes. so you decide for yourself about the setting and complexity of your game. if you want to add some new types of planes and scenarios you might be interested in one of the two expansions for aerial combat in world war I (watch your back, burning drachens). sometime soon i'll also write about the expansion for world war II and special miniatures for wings of war, which definitely should be also a lot of fun. so, just get the game and give it a try!! Wings of War is a game series which merges card and board game mechanics to recreate aerial combat. The first series of Wings of War games focus on the "knights of the air" age, World War I, portraying the abilities of the fighting planes of this period. 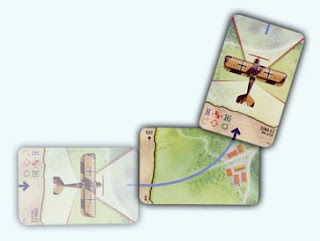 Airplanes are represented by a single card which is used as a playing piece on any open surface; the players choose and play simultaneously movement cards to decide the actions of the airplane they control. Different planes use different decks of movement cards to represent their different maneuver capabilities, and different deck of "Fire" card are used to take into account their fighting effectiveness and to keep track of damage. Each Wings of War set is a complete game for 2 to 4 players which may be combined with additional sets, or with other copies of the same set, to play larger games. For that purpose, 23 planes with different colors are included in each box. Each one is depicted after accurate historical documentation. 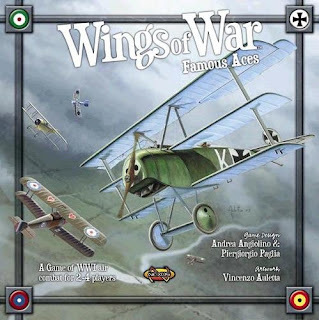 Wings of War - Famous aces is the first set of the WWI collection. It includes 5 models of planes: the Spad XIII, Albatros D Va, Sopwith Camel, Fokker Dr1, Sopwith Triplane. Each one was flown by an ace: between them Baracca, von Richtofen, Rickenbecker, Fonk, Olieslagers, Bakers. There are also 4 decks of movement cards, 1 deck of combat cards, rulers, counters and a promo card of the second set, Wings of War - Watch your back!, depicting an Austrian two-seater Ufag C.I. wings of war - download the rules here!